According to ComScore, social media now reaches over 82% of the worlds online population. Nearly 1 out of every 5 minutes spent online is used to engage on Facebook, tweet on Twitter, connect on LinkedIn – along with other social media activities. Approximately 33% of US mobile users access social media on mobile devices. And a century of video is uploaded to YouTube every 10 days. 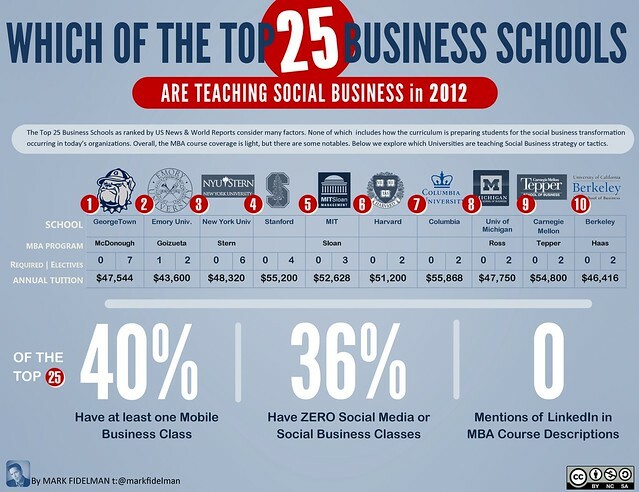 Yet 36% of the top 25 business schools do not have a single social media or social business focused class. And most of the rest have only cursory coverage.